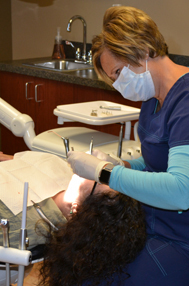 Dr. Hanna and his staff make going to the dentist stress free. Finally I don't mind going to the dentist. I have been a patient of Dr Hanna's for 4 years and actually enjoy being in the office. I wanted to thank you for all your efforts to fix my teeth. I want to thank you for restoring my pride and self confidence. You will never know how much this has changed my life. Thank you for all of your kindness. Dr. Hanna your kindness and bedside manner went above and beyond your duties as a dentist and your staff was wonderful. May God Bless you all. Last night, 4th of July, I had a dental emergency and Dr. Hanna came in to take a look and figure out a game plan for me. I've been seeing him for almost 15 years now but this was just above and beyond!! I can't even express how much I appreciate what he did for me and made me feel much more at ease about my situation. Wonderful practice!! Love the entire staff! !